Ella May Jacoby was born in Windom, Minnesota in 1892. She moved with her family to Dundurn SK when she was ten. She studied art at the Chicago Art Institute and attended the Northwestern University School of Music. She met her husband, Osmond James Walker, while the two were students at the University of Saskatchewan. They were married in 1918, lived briefly in Montreal, where her husband earned a Ph.D. in Chemistry at McGill University, and moved to Edmonton in 1920, where he joined the staff of the University of Alberta. Ella May Walker was an accomplished author, musician, and artist. She wrote a novel entitled 'Fortress North', which dealt with the early history of the Edmonton settlement. She also wrote a regular column for the Edmonton Journal. Ms. Walker was also prominent in the local art, theatrical, and musical communities. 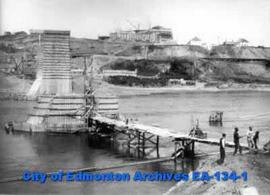 She was one of the first members of the City of Edmonton Archives and Landmarks Committee. Wilfrid Walker is the son of Ella May Walker. Richard Secord, Eleanor Silver (Dowding) Keeping, and C.E. Holder acquired her paintings through sale or gift. The fonds consists of correspondence and interviews relating to the research for her historical novel, 'Fortress North'. It also includes a manuscript for the book and her ink and watercolour illustrations for each chapter, a series of historical paintings of Edmonton and area, records relating to her work for the City of Edmonton Archives and Landmarks Committee, and miscellaneous correspondence, sketches, and notes. The photographs include various Edmonton scenes, the Walker family and friends as well as photographs of her paintings and woodcut prints of images used for her book. The artwork includes her original paintings and two sculptures. This fonds was donated to the City of Edmonton Archives by Wilfrid Walker in 1960. Items have also been donated by Richard York Secord in 1984, Dr. Eleanor Silver (Dowding) Keeping in 1985 and Irma Young in 2011. One item was purchased from C.E. Holder in 1977. The photographs were assigned item numbers with the prefix EA-10 or EA-134. Includes 14 photographs, 33 paintings and 2 objects.